Scientists have sequenced the genome of the common bean, the world’s 10th-most common food crop. The results are revealing new details about how the plants fix nitrogen, were domesticated, and how they resist disease. 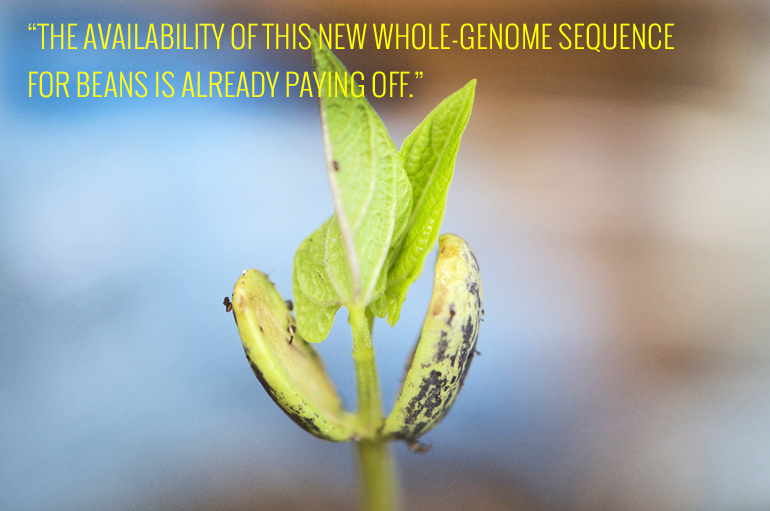 “The availability of this new whole-genome sequence for beans is already paying off,” says Paul Gepts, a plant scientist at University of California, Davis, who leads the bean-breeding program and is responsible for producing new varieties of common beans and lima and garbanzo beans. Researchers are using the new sequence to confirm many earlier findings, including to identify the common bean’s two points of origin and domestication—one in the Andes and the other in the Mesoamerican area of Central America. They also are working to identify genetic markers that will speed up efforts to breed new bean varieties in the United States, East Africa, and other countries. The common bean, Phaseolus vulgaris, includes kidney, navy, string, and pinto beans. All of these well-known bean varieties share with the closely related soybean the highly valued ability to form symbiotic relationships with “nitrogen-fixing” bacteria in the soil. Working together, the plants and bacteria convert nitrogen in the atmosphere into ammonia—which includes nitrogen in a form that enriches the soil and feeds crops. Nitrogen-fixing crop plants can actually reduce or eliminate the need for farmers to apply expensive fertilizers. The common bean is thought to have originated in Mexico more than 100,000 years ago, but was actually domesticated separately at two different geographic locations in Mesoamerica and the southern Andes. “This finding makes the common bean an unusually interesting experimental system because the domestication process has been replicated in this crop,” Gepts says. The project was led by researchers at the University of Georgia, US Department of Energy Joint Genome Institute, Hudson Alpha Institute for Biotechnology, and North Dakota State University. The US Department of Energy and Department of Agriculture funded the research, which was detailed in an article published in Nature Genetics.